NPR said the images of Sanumdong, one of the facilities Pyongyang has used to produce inter-continental ballistic missiles and space rockets, were taken days before US President Donald Trump and North Korean leader Kim Jong-un met in Hanoi for their high-stakes summit, which ended in failure. The photos by the firm DigitalGlobe show the presence of cars and trucks at the site on 22 February, said NPR – which has exclusive access to the imagery. “When you put all that together, that’s really what it looks like when the North Koreans are in the process of building a rocket,” Jeffrey Lewis, a researcher at the Middlebury Institute of International Studies at Monterey, was quoted as saying by NPR yesterday. 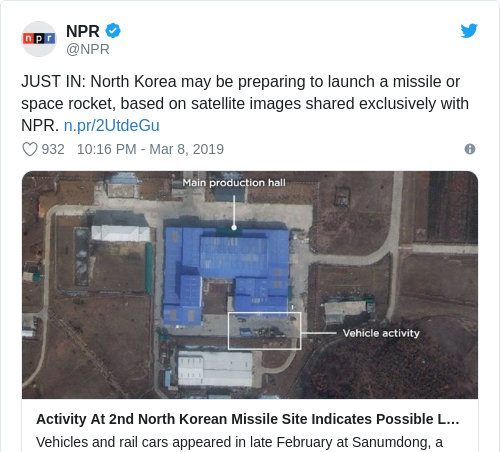 The Sanumdong analysis comes days after the specialised website 38 North and the Center for Strategic and International Studies said Pyongyang may have resumed operations at its long-range rocket launch site at Sohae, based on their study of satellite imagery from 6 March. The development is likely to further compound Washington’s frustration over the lack of progress in its bid to get the North to give up its atomic arsenal, especially after the 27-28 February summit between Trump and Kim collapsed without so much as a joint statement – let alone an agreement on nuclear disarmament. But North Korean foreign minister Ri Yong Ho disputed the US account, saying Pyongyang offered to dismantle all “nuclear production facilities in the Yongbyon area” in exchange for partial sanctions relief. Trump said yesterday that his relationship with Kim “remains good”, despite the setback in Hanoi. Kim released his first public message since the Hanoi summit today earlier this week, instructing propaganda officials to conduct “positive information” activities to spur scientific and technological development, according to a morning report by North Korean state media outlet KCNA. Email “Kim Jong-un may be preparing a missile or space launch, says US report”. Feedback on “Kim Jong-un may be preparing a missile or space launch, says US report”.